SPX-1 Automatic Single Head Capping Machine is new production, developed by factory. It equipped positioning plate for interval running, capped by double magnetic moment rotating heads. The machine has practicabillity in field of pharma, pesticide, chemical, foodstuff. Its ideal equipment for bottle capping. Also applied to seal aluminum cap, anti-theft cap, screw-thread cap. High qualified ratio of cap handing and rotating (sealing). Plate positioning, convenient to change size, large range of adjusting. Bottle feeding and exiting fluently, frequency conversion control speed. Compact structure, easy operation and maintenance. Magnetic moment cap rotating, tightness may be adjusted freely, not damage the bottle and cap. Continuous operation, completing automatic production, saving time and improving benefit. The whole machine is designed accordung to requirements of SPX. 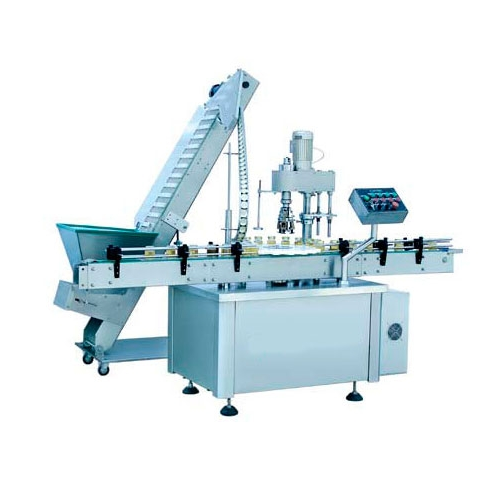 Looking for ideal Fully Automatic Capping Machine Manufacturer & supplier ? We have a wide selection at great prices to help you get creative. All the Automatic Single Head Capping Machine are quality guaranteed. We are China Origin Factory of SPX-1 Automatic Single Head Capping Machine. If you have any question, please feel free to contact us.